Don't be caught off guard. If you're in a serious relationship and think your partner might be getting ready to pop the question, start thinking now about how you'll respond. A marriage proposal is a pivitol moment for any relationship since the futures of two people are set in motion by the answer to the question. Sometimes a woman can see that proposal coming and already knows how she wants to respond. 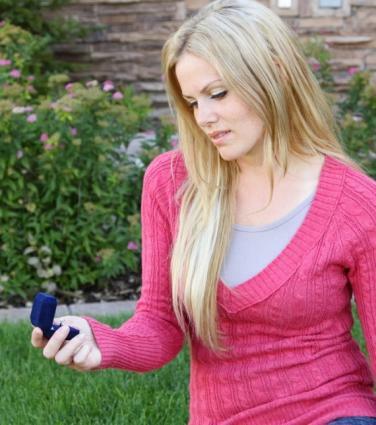 In other cases, her partner might just catch her off guard with a surprise proposal. No matter how that proposal comes, it's important to think about your reply before you give an answer that is going to change your entire life. Naturally, saying yes is always easiest when you're both on the same page and looking forward to building a life together. A simple, "Yes" is enough to seal the deal, but maybe you want to say a little more to make the moment as special for your partner as you can. "Yes! I've wanted to say that to you for so long." "Yes, I can't think of anything I want to do more than spend the rest of my life with you." "Of course I will. Was there ever any doubt?" "You're the love of my life, and my answer is yes, yes, yes!" Refusing a proposal is much tougher than saying yes. After all, you've probably been in a caring relationship for a while before your partner pops the question, and you don't want to hurt his feelings even if you aren't ready for marriage, don't think marriage is a good idea at this point in the relationship, or don't plan to marry. "I'm sorry. I care about you so much, but I don't think we want all the same things in life. I think it would be wise if we didn't marry, at least not right now." "I'm flattered that you care for me enough to want to marry me. I'm just not interested in getting married, and I think you should marry someone who can truly give you the love and commitment you deserve." "I think you're wonderful, and I wish I could say yes, but I just don't feel in my heart that we're right for each other. You may not see that now, but when you do find the right person, you'll be glad you're still free to propose to her." Sometimes love happens so quickly that your partner proposes a lot sooner than you may be ready for. This is perhaps the most delicate situation encountered in any marriage proposal because your partner could be crushed by anything other than a firm "Yes!" Still, no one should ever rush into marriage before both partners are completely sure they are doing the right thing. If you're not ready to say yes or no, you have to find the right way to say that you need more time. "I know that I care for you very much, and I think our relationship could really grow into something wonderful. I just believe we need see how things develop before we consider such a life-changing commitment." "I really do love you, and I'm not saying no. I just really need more time. I hope we can talk about both of our expectations for the future, and then maybe one day you'll want to ask me again." "This is so sudden. I love you, but I'm not ready to talk about marriage yet. Let's take more time getting to really know each other, and then maybe we can talk about marriage later." Regardless whether you answer with a yes or no, you want to make sure your partner understands your response. Consider these points. Your partner deserves a clear answer, so make sure that's exactly what you give. Don't offer a vague response like, "Maybe..." or put conditions on your acceptance. Don't allow yourself to be pressured into saying yes if you're not ready. Tell your partner what's in your heart. If he's the man you think he is, he's going to appreciate your honesty. Tell him he's the one for you if that's what you feel. If he's not, he deserves to know so both of you can get on with your lives. 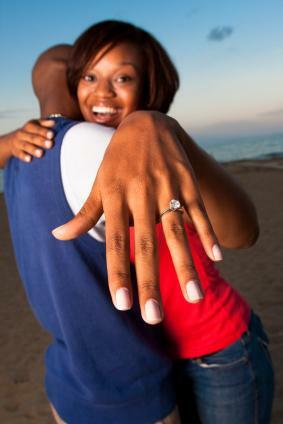 Waiting for an answer can be agonizing, so don't leave things hanging in the air after your partner pops the question. It's alright to say you're not ready and that you need more time if that's the case, but do make sure your partner knows that the subject is tabled for the time being. On the other hand, don't walk away knowing in your heart that you intend to say no eventually. It's better to be brave and let your partner down now rather than give him false hope. Proposals are often rehearsed to get the wording just right. After all, it can be a bit nerve wracking asking someone to marry you. Even so, replies should sound natural and come from the heart even if you've already put great thought into how you'd answer this all important question. When the answer is yes, a lot of kissing and declarations of love are sure to follow. Such a happy response usually gives way to thoughts of sending out engagement announcements and making wedding plans. 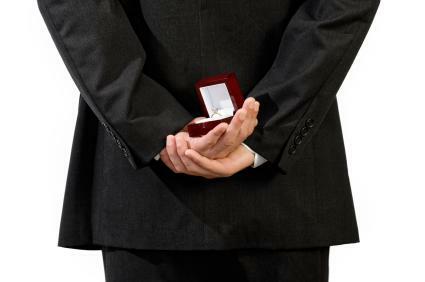 When the answer is no, your partner is at least entitled to know why you feel you can't accept his proposal. Try to be as gentle and tactful as you can without causing more hurt and misunderstanding. If you tell your partner you just need more time, make it clear that you don't want the relationship to be over. Share the things you think both of you should know more about each other before you consider taking the leap together, and then spend time exploring the answers together. Tell him you're willing to be the one to bring the topic up again because that takes the pressure off of him trying to read your mind before he decides whether to ask again. If it becomes clear that the two of you are destined for one another, you could even surprise him with your own romantic proposal. It's important for any couple to really discuss what they want out of life before anyone proposes marriage. They need to make sure they're both on the same page about having children, where they want to live, the importance religion might have in their lives, their financial situations, and many other crucial details that could affect their long-term compatibility. Being is love is very romantic, but a marriage takes a lot of hard work and compromise to make a success. If you get all of these issues out in the open ahead of time, it will be easier to know what to say when your partner asks you to marry him.